It’s hot! Summer is the season we long for year round, yet many of us have difficulty acclimating to the intensity of summer heat once it is upon us. I have great respect for Traditional Chinese Medicine. The wisdom of this ancient tradition gives us guidelines to help us stay balanced by implementing simple seasonal shifts in diet and lifestyle to help us thrive through each season. Summer is synonymous with cool foods. We naturally crave juicy, ripe fruit and salads to offset increasing internal heat. High water content foods help hydrate the body in ways water can’t. The best analogy is the difference in your garden after a summer deluge as opposed to watering it with a hose. The contrast is stark. The same applies to the level of hydration that comes through food. It has vitamins and minerals in perfect balance, nourishing the body at a cellular level. I love creating easy recipes made entirely from raw vegetables. With farmers markets and local grocery stores overflowing with summer produce it’s easy and inspiring to create beautiful and delicious meals in minutes. Here are 2 recipes that use zucchini or summer squash as the base for both dishes. Its delicate flavor and ubiquity at this time of year make it the perfect choice. Both recipes are gluten free. These recipes will feed 2 hungry people as a main course or for 4 as an appetizer. 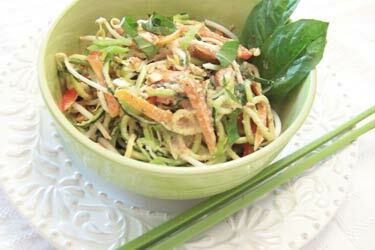 This Pad Thai is raw and very simple to make yet the flavors are rich and complex. The key is to prep all your vegetables in advance and toss with sauce just before serving. I highly recommend purchasing the Spirooli which makes noodles out of zucchini. If you don’t have one, simply use a vegetable peeler to make long strips. 1. In a large mixing bowl, add zucchini. Arrange all other vegetables in small groupings on a dinner plate. 2. To make the sauce, combine first 7 ingredients and mix well. Add almond butter and mix again. Add water to thin. 3. Pour half the sauce over zucchini and toss well to evenly coat. Toss in remaining vegetables and pour in remaining sauce and toss again. 4. Portion out equal amounts in 2 bowls. Toss crushed almonds equality on each portion and a sprinkle of basil and cilantro for garnish. 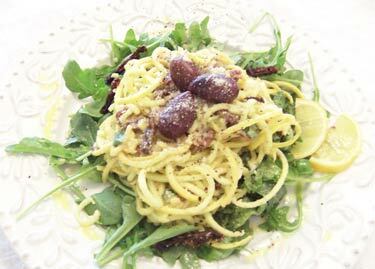 I use yellow squash for this recipe so it really has the visual look of traditional pasta. The cashew Parmesan creates a creamy rich texture and flavor which is intensified by basil and sun-dried tomatoes. Again, I used the Spirooli to make zucchini pasta. 1. Place yellow squash noodles in a large bowl. Add a dash of Himalayan salt and drizzle of olive oil. Toss well. 2. In a mixing bowl, add cashew Parmesan, olive oil, garlic, lemon juice, salt and pepper and mix well to create a creamy consistency. 3. In a separate bowl, gently toss the arugula with 2 Tbs. of dressing. 4. Add sun-dried tomatoes and remaining dressing to the yellow squash and toss to evenly coat. 5. Arrange arugula on 2 dinner plates. Add equal portions of squash noodles on each plate. Garnish with fresh basil, olives, cracked pepper and a drizzle of olive oil. 1. Place all ingredients in a food processor and pulse until broken down to Parmesan like consistency. 2. Store in a glass jar in the refrigerator. Want the Spirooli? I got mine on AMAZON.